No matter what your age or physical conditioning, Release offers fitness programs to help you reach your personal wellness goals. Are you seeking a deeper level of fitness, that goes beyond the “no pain, no gain”philosophy? 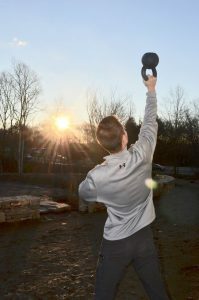 Release offers a variety of fitness classes that integrate effective workouts with mindful practices, which will leave you feeling stronger in both body and mind. Pick your favorite classes from our variety of fitness offerings. As you embark on your journey, we are there with support, guidance and encouragement to empower you to be your best. Pre-booked Yoga, Fitness and Meditation classes may be cancelled up to 3 hours prior to class time without penalty. Classes cancelled within a three hour window will not be refunded. Member cancellation policy is as follows: Pre-booked Yoga, Fitness and Meditation classes may be cancelled up to 3 hours prior to class time without penalty. Classes cancelled within a three hour window will receive no charge for first miss per calendar month, $10 for second miss per calendar month, $20 for 3rd and any additional misses per calendar month. Waitlist Policy: If you are not in class when it starts, your spot will be given to someone on the waitlist. The small group personal fitness training program at Release is the pinnacle experience for enhancing one’s physical body and mental constitution. Our program is designed to offer the right guidance, motivation, and learning opportunity so that reaching your peak health and well-being is achievable and fun! The workouts are structured to address the total body and mind in 60 minutes. We focus on mindfulness and breath during warm ups, followed by a series of independent exercises to increase strength, build muscle, burn fat, and enhance total body stability. These workouts will primarily focus on weight training and incorporate core stability segments, plyometric and agility work, cardio and HIITT. We help you tune in to isolate the correct muscle groups and make purposeful decisions about intensity level, so you can focus on improving health, protect your body, and maintain that mind-body connection throughout your session! We conclude each session with light stretching and breathing techniques so that you leave feeling strong, calm and focused for the rest of the day. A full body barre class using different props that will leave your entire body thanking you. Tone, lengthen, and strengthen…this class is for all levels. Cardio Sculpt is a high energy workout that combines strength training exercises with short cardio bursts designed to optimize fat burn and sculpt your body. CycleYoga Fusion is a combination of Cycle and Yoga. This 60min class will consist of 30min Cardio, followed by 30min of a yoga stretching flow. All levels welcome. Please bring Cycle shoes or sneakers, a mat and water. Cycle is a 45 or 60min cardio adventure! Ride, Sweat, and have fun all on a bike. New comers and beginners are always welcome! **New cycle members please arrive 10-15 min early for set up. CYCLE combined with great upper body work. This amazing fused class combines Cycling and light weights to give you a full body workout all on the bike! Riders will burn calories strengthen their upper body…..all in 45-60min! New riders please arrive 15min early for proper set up.Bring water! Circuit Training is a quick moving circuit class. Each station will challenge your fitness level at a safe pace. Please wear sneakers and bring water. Modifications to each circuit will be given as well. Freestyle circuit training is a holistic body workout with an inexhaustible variety of exercises that is highly effective, efficient and time-saving at the same time. It is a circuit style class and each program focuses on different training variables and can be adjusted to personal needs and are therefore open to all experience levels. This strength class will use weights and props to get you a full body workout. Join us for a Happy Hour like no other! This class will provide a combination of strength and cardio training for a total body workout that will improve your endurance, build strength and have you burning calories well beyond the one hour class. We will use a variety of formats including Tabata, AMREPs (as many reps as possible), TRX and ladders and will incorporate games that will not only bring variety but fun to your workout. This class is for any fitness level, beginners are always welcome and intensity can be adjusted based on your needs and fitness goals. We are serving up strength and conditioning for this Happy Hour satisfying your appetite for a healthy life! MELT treats the nervous system and the connective tissue system. Using specialized techniques, a soft body roller and four different balls, MELT rehydrates the connective tissue, rebalances the nervous system and restores space to compressed joints. MELT is for anyone who wants to slow down the aging process and live pain free. MELT is also for active young adults and athletes who want to maintain a fit, healthy body and achieve optimal performance without debilitating wear and tear. Adding MELT to your current routine can boost the results of other activities and practices. Nia®️ is a fusion of dance, yoga and the martial arts done barefoot to soul-stirring music that will free your body and your mind. It’s a fitness class that will workout, not wear out your body. Wherever you are in terms of fitness level, Nia will meet you there. Core focused, pilates is a great way to lengthen, straighten, and tone your entire body. The small group personal training is also offering senior only sessions, where guests over the age of 65 can receive personal workouts guided by one of releases fitness experts. Workouts are designed and further modified during the session to provide each guest with a safe, effective and fun workout experience. The small group senior personal training is a great opportunity to work towards peak physical wellbeing, no matter what age you are! 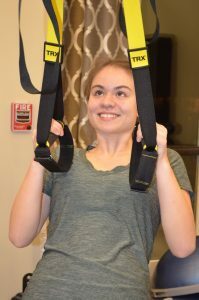 Using TRX suspension straps, along with different fitness equipment this class will focus on toning, tightening, and strengthening! Each week different equipment will be used, and different exercise will be introduced. This will be a fun class, using music and the clock to guide you through each exercise. Please bring water.